I totally didn't finish the aprons yesterday. 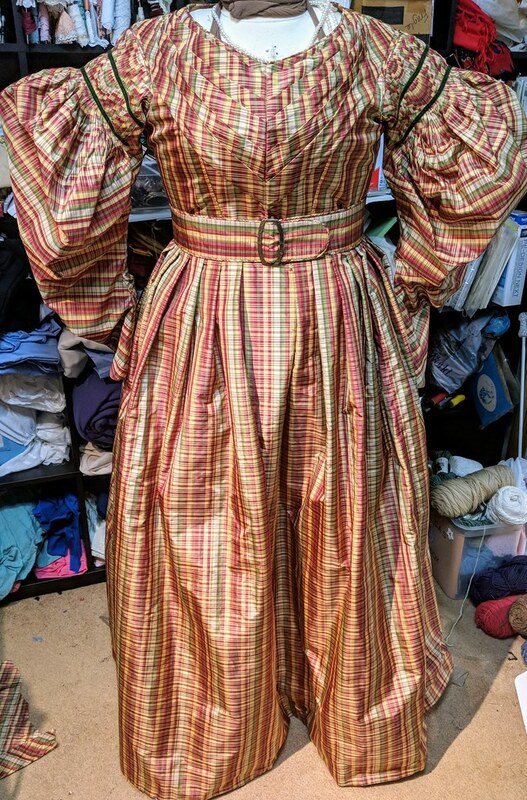 We got all the fittings done on everyone that we needed to, and I did finish the 6 eyelets on the one apron, and pinned all the waistbands in place. I've now handed those off so that they can have designs painted on them, and I'll do the rest of the sewing on them on Thursday during rehearsal. What I did last night instead was to start on making a flying carpet rig for one of the actresses. It's made of a piece of hardware store-grade foam core (from the insulation section). It was already mostly cut to size, but I cut wider the hole for her to stand in, and glued purple crushed panne velvet to both sides of the board. I also added straps out of wide grosgrain, which come up from underneath the board in the hole, and will go over her shoulders. It still needs trim, and will also have fake legs sitting on the carpet, with a black curtain of fabric to hide her actual legs. It's wearable currently, for her to use at rehearsal tonight, and I will finish it when I'm at the theatre for Wednesday's rehearsal. Tonight I hope to make a pair of bloomers for the show, and get my gala bodice cut out and assembled. I'm also going to Joanns to hopefully pick up the last materials I will need for the bodice. Monday's fittings went really well for the show - there were several tweaks to be made on Snow White, and one pair of shoes that needs to be reordered, plus one of the actors had a plane delay and wasn't there, so unfortunately we didn't get to try out anything on her (and she has three costumes!). 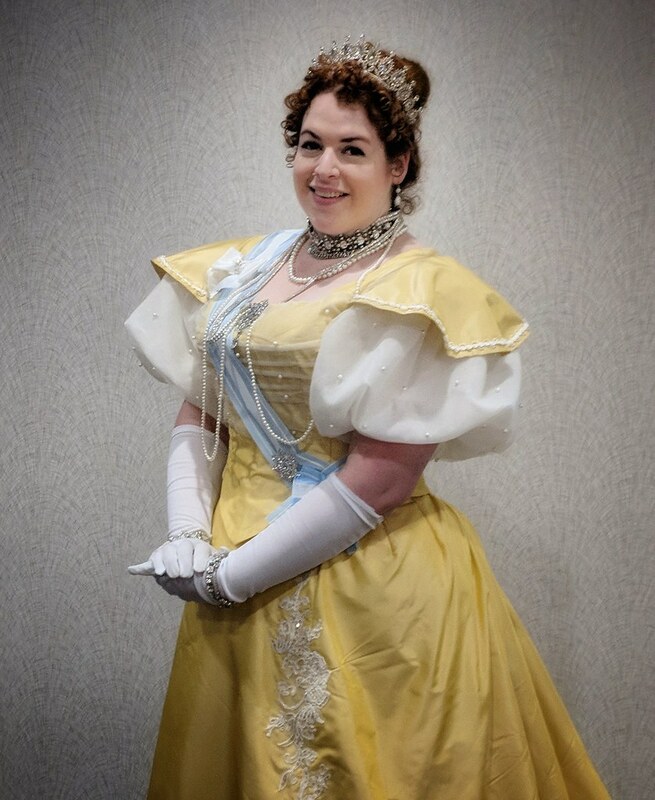 I didn't get as much done on Cinderella as I had wanted to before the fitting, so it had too many pins in it, and I didn't want the actress to try it on. But luckily, they've pushed back the promo shoot to next week, so we have all weekend to finish the costumes. I was able to hand off Rapunzel, Belle, and Mulan to my second stitcher, and my first stitcher has Snow, Frog Princess's 2nd costume, and Pocahontas. I'm working on Cindy, followed by Ariel's tail. 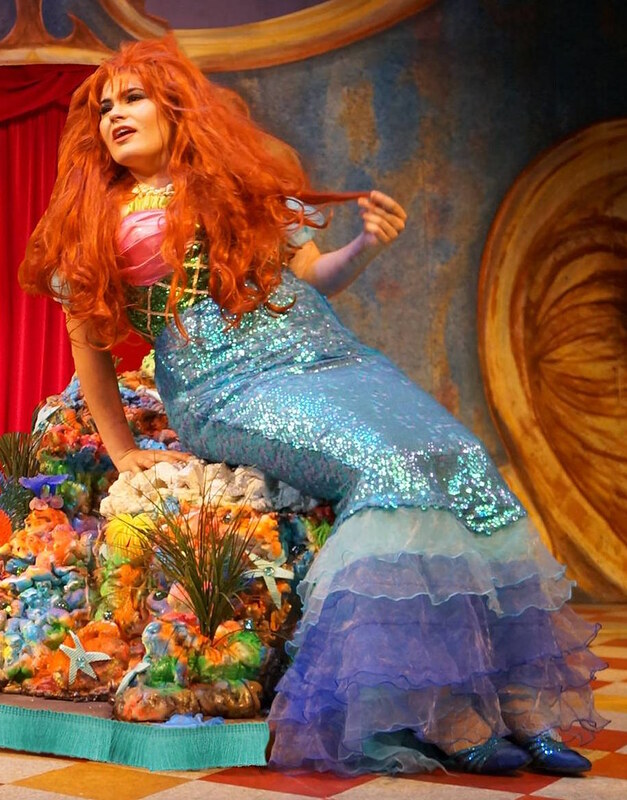 We need to try stuff on the Ariel actress before we can work on anything else for her, and we also have the Frog Princess's ballgown, Sleeping Beauty, and Balroubadour (a take off of Jasmine), and we open in exactly one month. I think we're in a good place. I have nothing going on this weekend, so I was planning to spend all weekend sewing. But my weight has been up this week, so I've decided I'm going to use some of my free time to try the free 5-day pass at LA Fitness. I've been debating about which gym to join, so maybe this will help me decide. 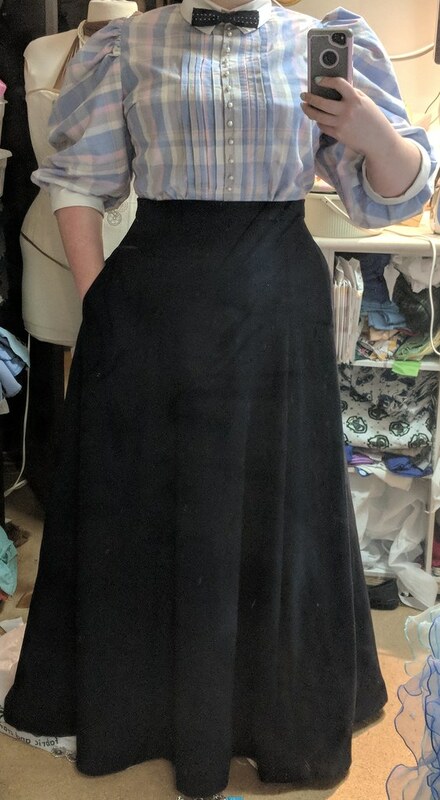 Anyway, other than that, I'm going to see Incredibles, finish Cindy, hopefully make Ariel's tail, and/or start on my 1890s shirtwaist/skirt. 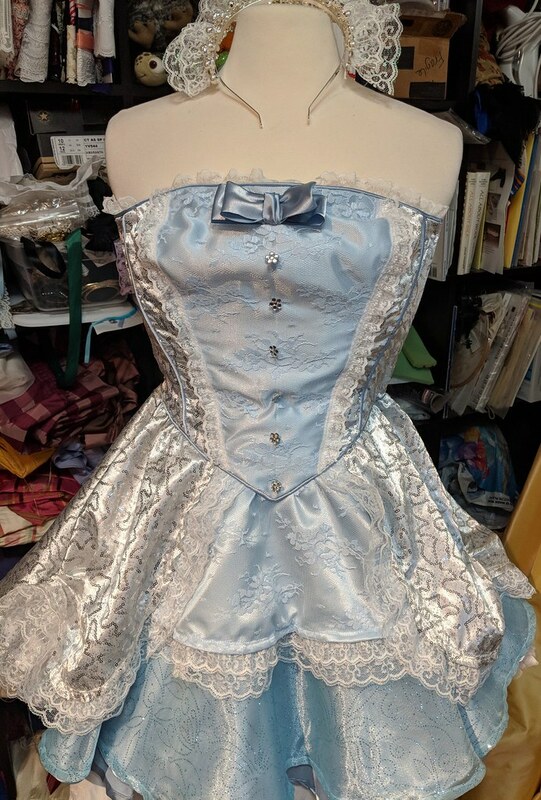 Yesterday, I sewed down all the piping on Cindy's bodice, and added trim to Snow's corset, so at this point, pretty much all I have on Cindy is hemming two of her skirt layers, and attaching the skirts to the bodice. Shouldn't be too bad. 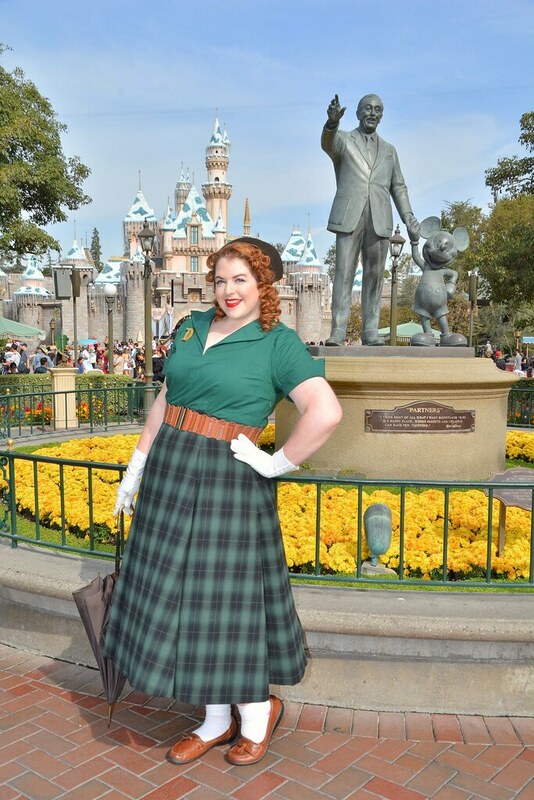 And on the plus side, all this work I'm doing on the show has already paid for my fall trip to Dapper Day at Disneyland! I have been deliberating more on my gala gown, though. I just can't get into right now, and I'm wondering if that means I have to change my whole design plan. Luckily, right now all I have is the base skirt, so I might just have to play around with various embellishment options, and see what calls to me. But that will be after I do the shirtwaist/skirt. Maybe by then I'll want to go back to the original design anyway. I'll post pics of Cindy soon - I keep forgetting to take them! I think my super hectic life is going to get a little easier this week. Which is good, because I have so much sewing to do. I started on Cinderella last week, but didn't get super far. 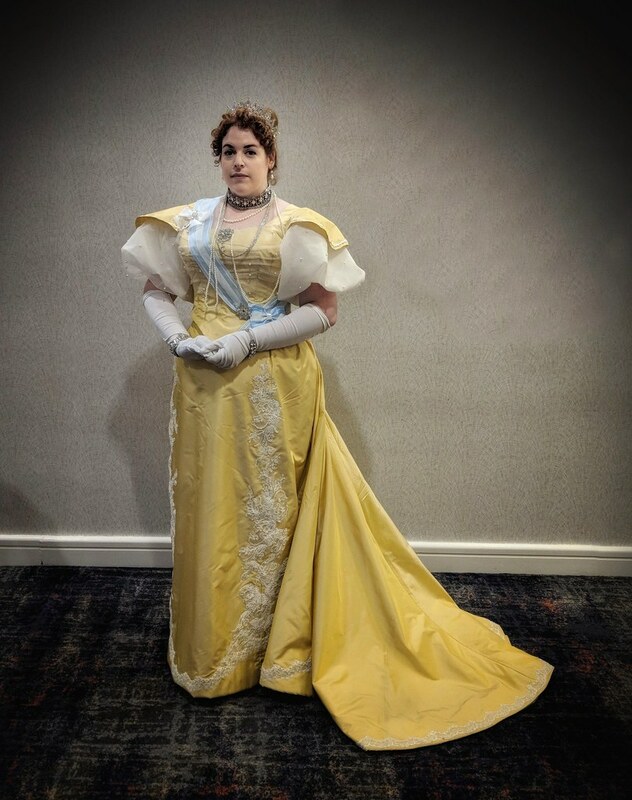 On Friday, though, I did a costume portrait session in my Titanic deck dress during the first part of the day, proceeded to get stuck in horrendous traffic trying to get home (it took me over two hours to go 37 miles), and then spent the whole evening sewing. I was able to finish getting everything cut out for Cindy, and sewed together the base of the skirt and the whole bodice (including piping!). It was a lot of cutting - the bodice is made of 9 pieces (it's an alteration to the Simplicity Frozen bodice pattern, but I added in an extra seamline on each side-front), and each of the pieces consists of a cotton layer and a sequined satin layer flat-lined together, except for the CF piece, which is cotton, satin, and lace together. 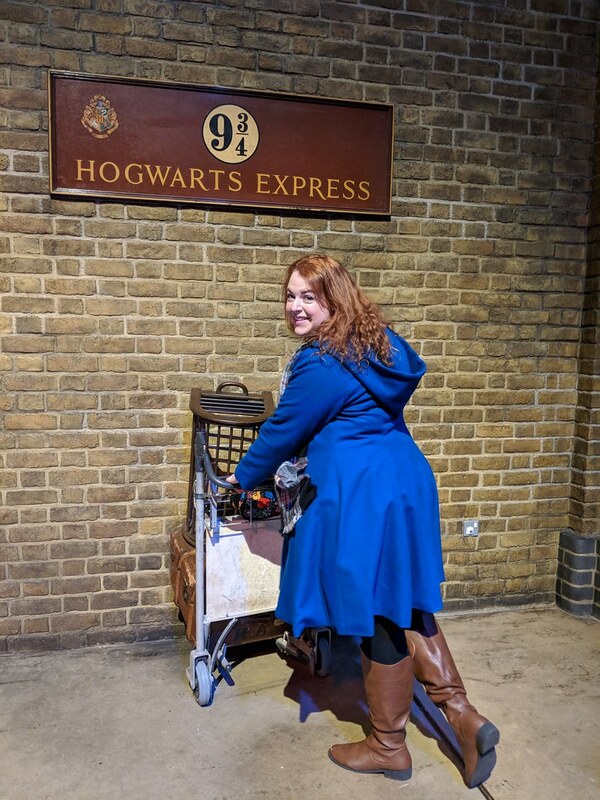 On Saturday, I subbed in to two children's shows, which were located in waaay northern WA. I left the house at 6:50am, and we got back to the Seattle area at about 5pm. The shows were well-received, but that was just way too far. 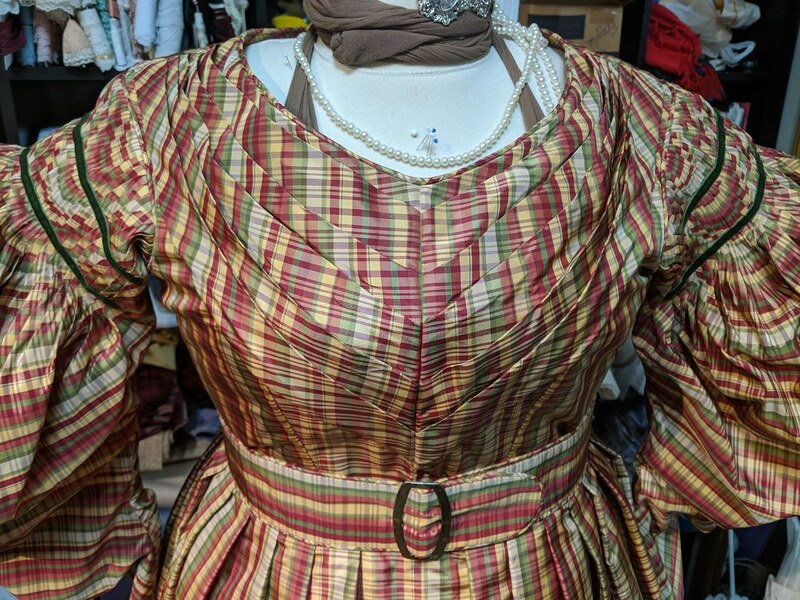 Then I had a fitting with two of the actresses for the show - the Cindy bodice fit almost perfectly - it was about .5" too long at the waist, but that's an easy fix. 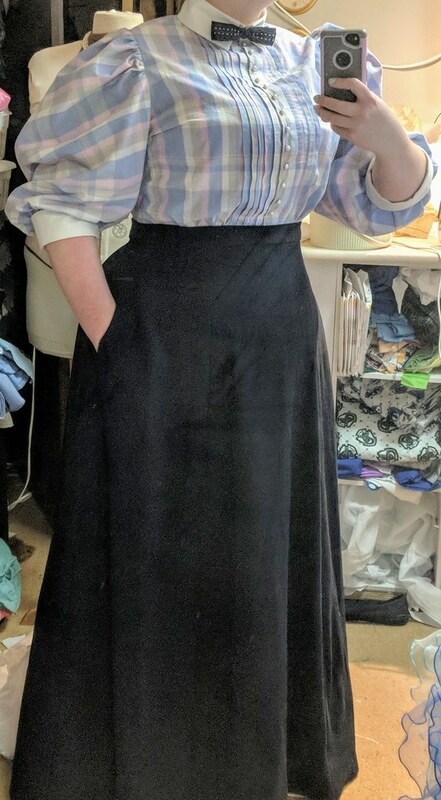 The skirt was about 3" too long, though, but I hadn't hemmed it yet, because I figured something like that would happen, so that wasn't terrible. We also did a fitting on the Frog Princess, and we had them try on all their accessories (which all fit! yay!). Then I went home and fell asleep on the couch right after dinner. On Sunday, I went to an estate sale way out in the edge of Auburn that I thought from the pictures was going to be in a historic house. It wasn't. I bought hangers, but it was otherwise disappointing. Then I went to Joanns and picked up a bunch of patterns for my stitchers, and then I saw a local production of Shrek. Then I came home, ordered what are hopefully the last accessories/notions that I will need for the show, ate dinner, and sewed. 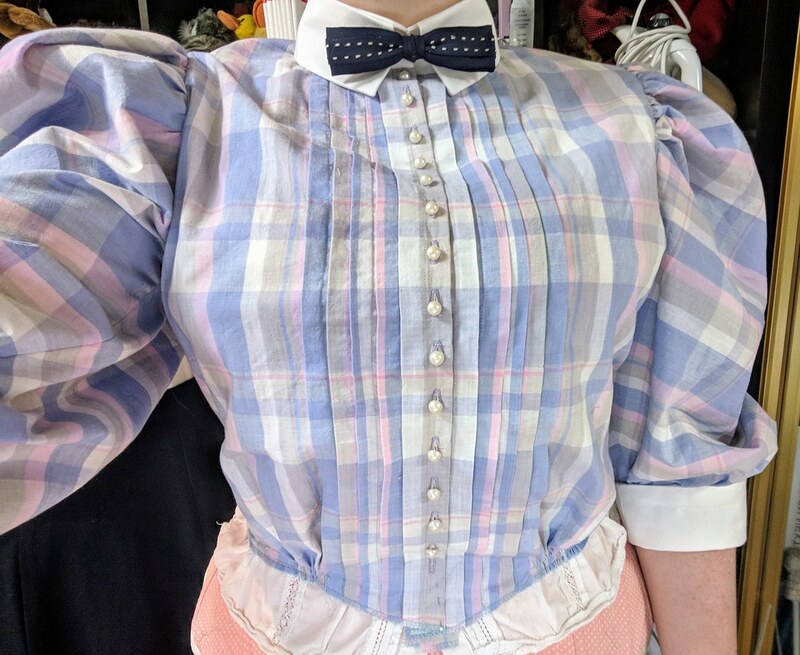 I made the necessary alterations to Cindy's bodice, which now just needs the piping at the top and bottom hand-sewed down and lace added to the top, plus some decorative buttons, and I shortened the three skirt layers. I also (mostly) made her bloomers. I ran out of elastic for the knees, and I have to add lace to the knees as well, so I'll be picking up more elastic today. 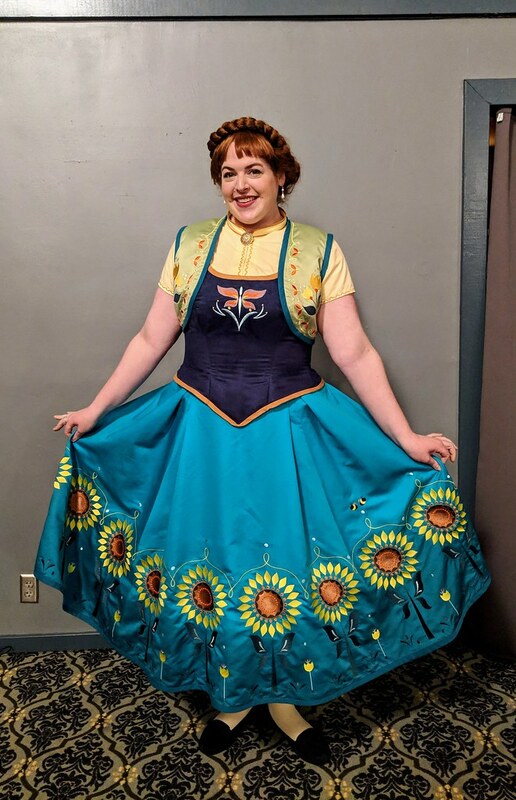 I also dyed Belle's dress fabric, since I remembered at 10:30pm last night that I hadn't done that yet (whoops), but it came out pretty much just right. And I separated out all the fabrics/patterns/notions into kits for my stitchers. We're having a fitting for the whole cast today at their first rehearsal, and I'll have both my stitchers there as well, so I can hand off at least a few more projects. I think at this point, there's just 2.5 costumes and a couple of accessories that aren't ready to be handed off, and they open in just over a month, so we should be in a good place. 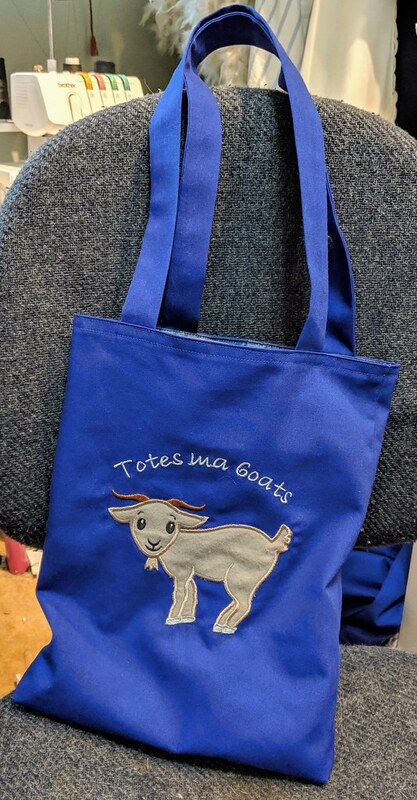 I'm excited to get the 4 large Joanns bags out of my sewing room, too! 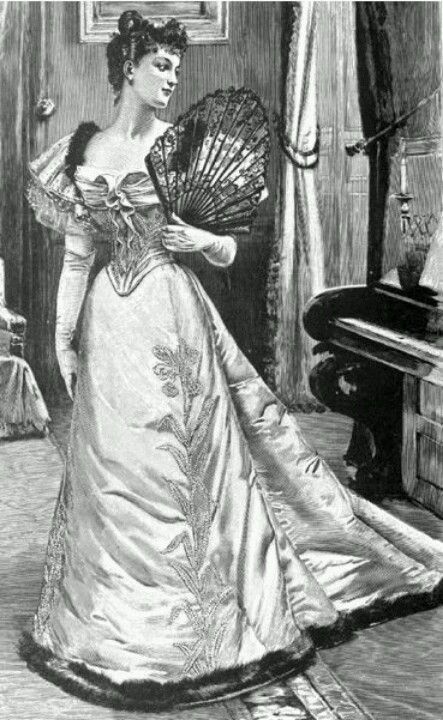 After I finish Cindy, I'm going to make Mermaid's tail, and then I think I'll do my 1890s shirtwaist/skirt. Other than rehearsal tonight, and a photoshoot for them later this week sometime, I have nothing else I'm committed to this week or weekend. I'm super excited. I haven't had this much time in who knows how long, so hopefully I'll get a lot of sewing done! So as to make this a post with pictures, here's a few selfies I took at the portrait session on Friday. I forgot how comfy that dress is. I just hope the shoes are comfortable enough to wear for both the Friday night social and the gala at CoCo, since they match both outfits! I put aside the gala gown last night, and decided to work on Cinderella for Disenchanted instead. 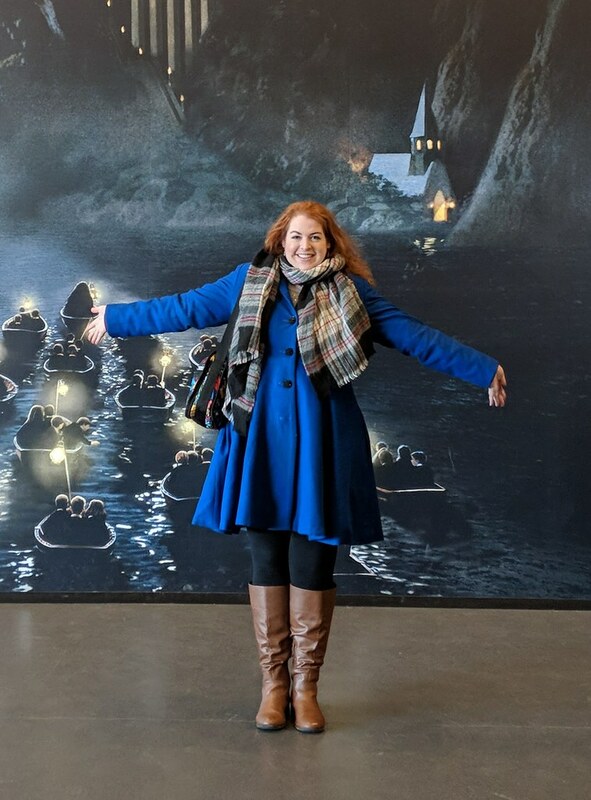 After work yesterday, I dropped off all the materials for three of the costumes with one of my stitchers, then went to Ross and picked up a few of the ready-to-wear pieces I need for the show. That all took a big load off. When I got home, I started cutting out the patterns and fabric for Cindy. I got her bloomers all cut out (cotton and glitter organza), and her underskirt (satin and glitter organza), but then I had to go to bed. 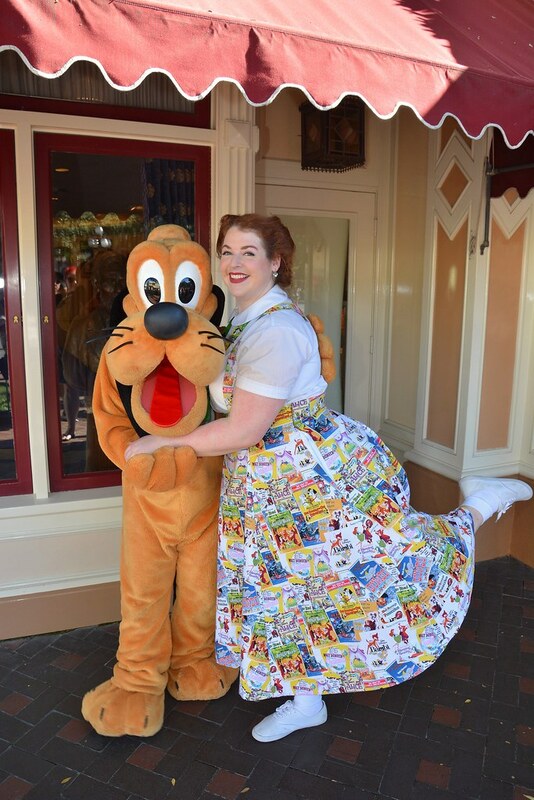 I doubt I'll have any time to sew today, since I'm going up to Seattle to see the Hunchback of Notre Dame tonight (so excited! ), but I'm looking forward to working on her more tomorrow. I think it should go together fairly quickly - I have an overskirt section, arm poufs, and the strapless bodice as well, and I won't be able to actually finish hems and binding until after the fitting next Monday, but I'd like to get the whole thing plus Ariel's tail done before then. 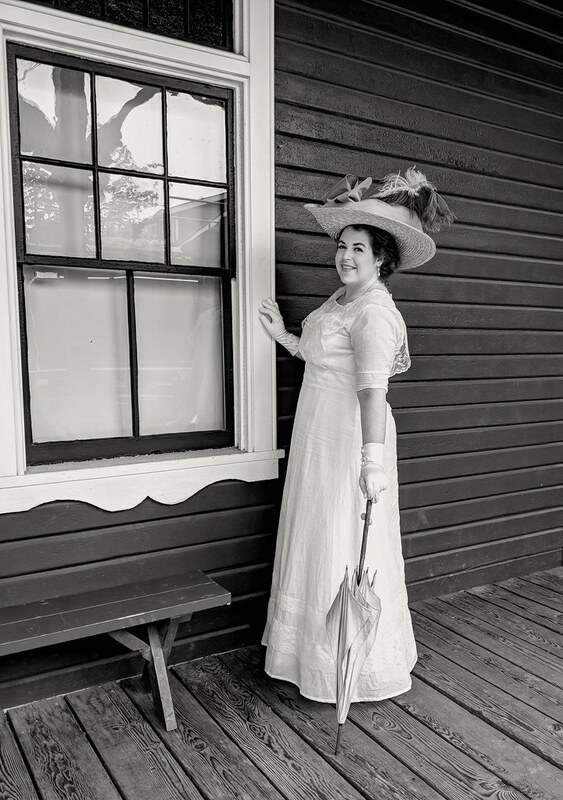 And maybe work on my 1890s skirt and shirtwaist a little, too, though I doubt I'll get that far, since this weekend is very full. 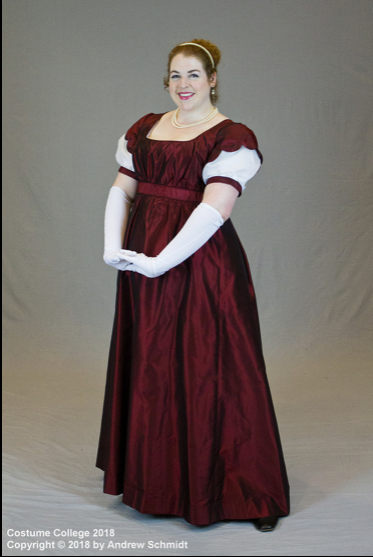 I still haven't touched the Regency dress. I feel like all my will to sew on it has gone out the window. I should probably put it aside and do other things, but since it is tech week this week, I know I'm not going to get any sewing done anyway. I have a ton of lines in this show, so I've really been trying to stay focused on it. 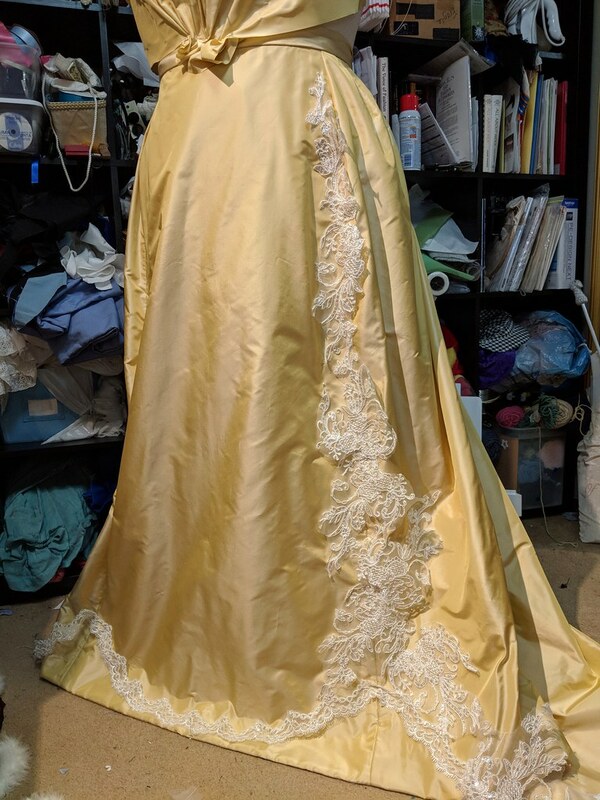 I did do an alteration commission last week on a formal dress, which literally took up all of my Mon-Thurs sewing time, even though it wasn't a big alteration. 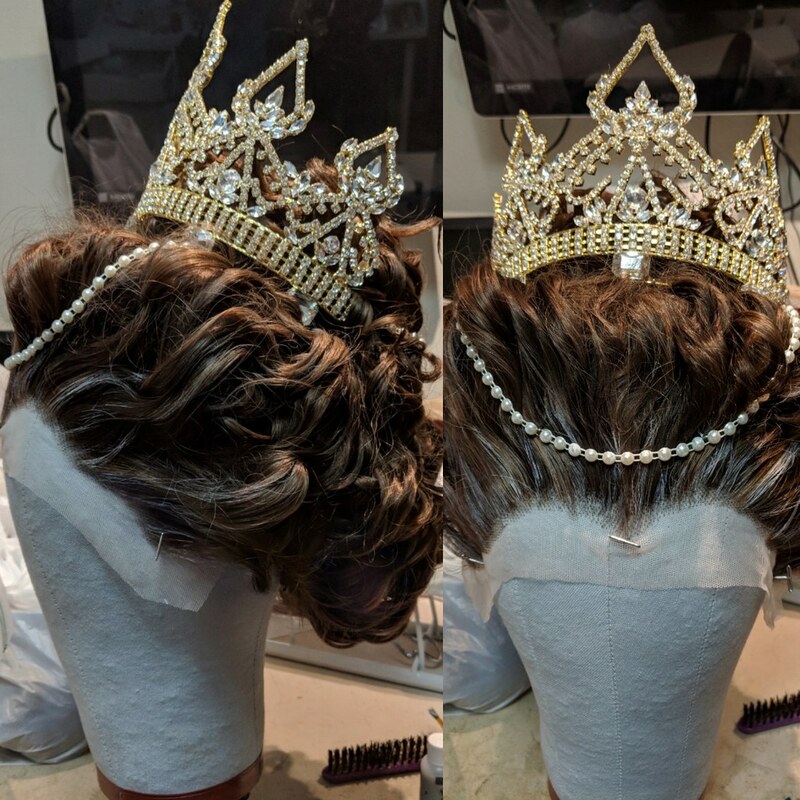 And on Friday, I styled a few wigs for the show, which is fun because they're nice quick projects that I can do in front of the TV. 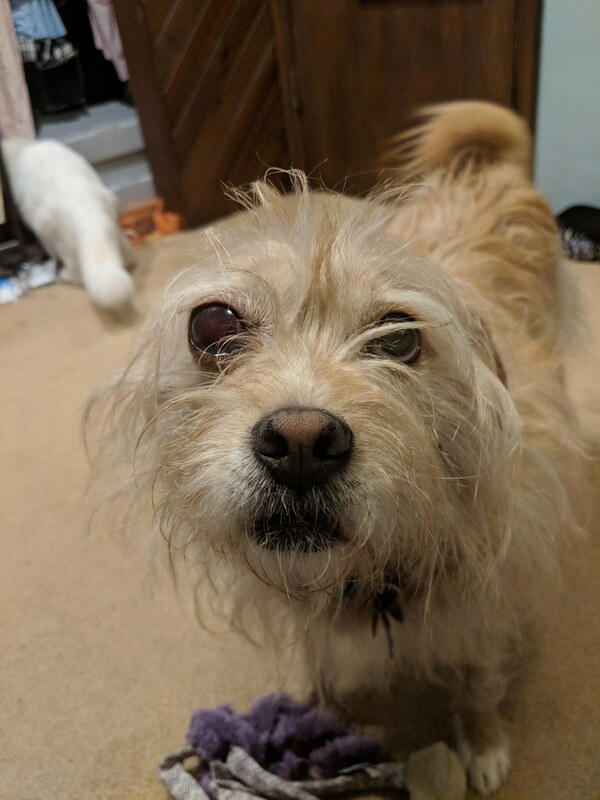 The other thing that has really been on my mind is that my dog, Lion was diagnosed with glaucoma in one eye about 1.5 weeks ago. I have been raising money through a GoFundMe, and had scheduled his surgery for May 14, so that it's after the show opened. But then this weekend, he developed hyphema as well, which is basically an emergency situation. So now this morning I had to drop him off at the vet for eye removal surgery. I'm going to miss that eye! And I've been sort of on edge and worried all day since I dropped him off. Hopefully I'll be able to pick him up in a couple hours. But anyway, for the last couple weeks, I've been more focused on him, so instead of sewing, I just snuggle with my puppy. My goal is that Monday, once the show has opened and I have evenings free, I'll jump back into sewing. 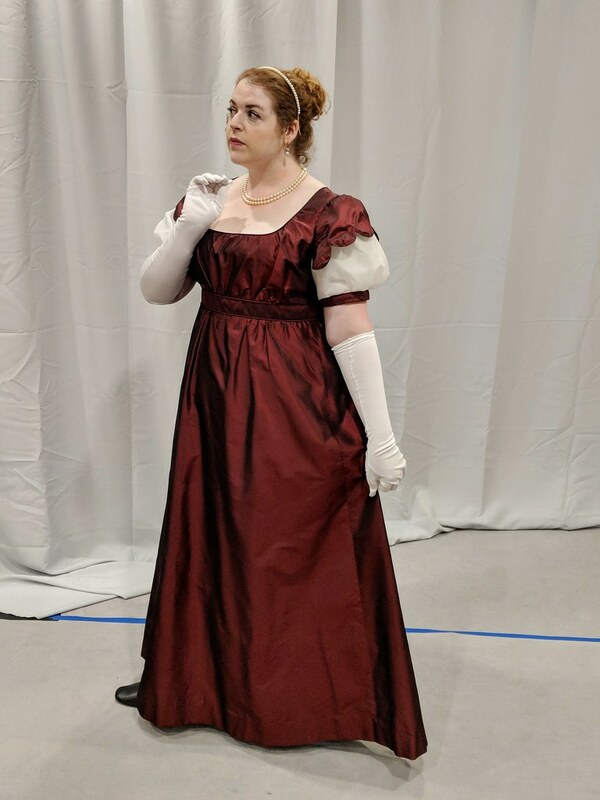 I'd love to finish the Regency dress and get it out of the way, but by then all my materials for the 1890s gala gown skirt should have arrived, so I might do the skirt, then mockup the corset, then go back to the Regency dress while I'm waiting on corset supplies. 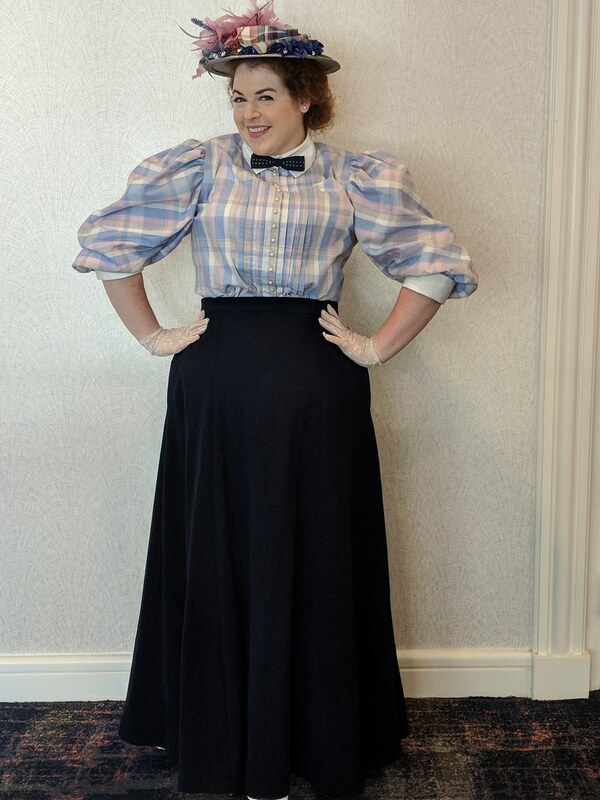 Though of course, part of me just wants to do the 1890s shirtwaist and skirt project really quickly, too, and get that out of the way instead. I guess I'll just have to wait and see how I feel on Monday. 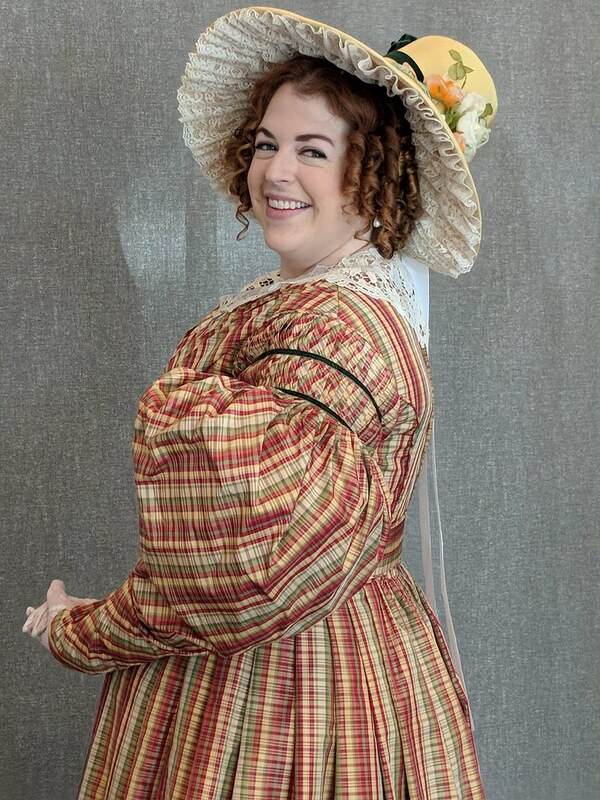 I finished my plaid 1830s dress yesterday! Here's some pics, and I should hopefully have pics of it on me on Monday, when we start dress rehearsals. Next, I'm going to make a super floofy cap to go with it. Should I use cotton organdy, silk organza, or something else (that would have to be available at Joanns)? 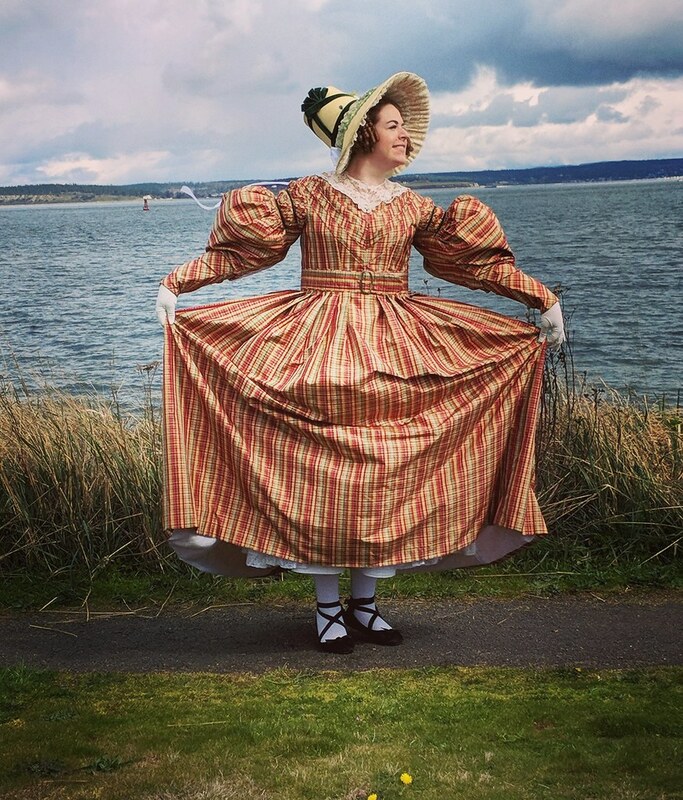 I did a bunch of work on the 1830s dress this weekend, though not nearly as much as I was hoping to accomplish. In fact, I spent all day Saturday trying to get the bertha to work. I need to remember to try the bias strip method the next time I make a bertha, instead of just pleating bias fabric and attempting to get it to be perfect, because that is basically the most time-consuming and annoying thing ever. But anyway, the whole dress is entirely done at this point except the hem (part of which is pinned), and the sleeve hems. I'm hoping to do most of that today, since I'm able to do a fair bit of handsewing while I'm at rehearsals. 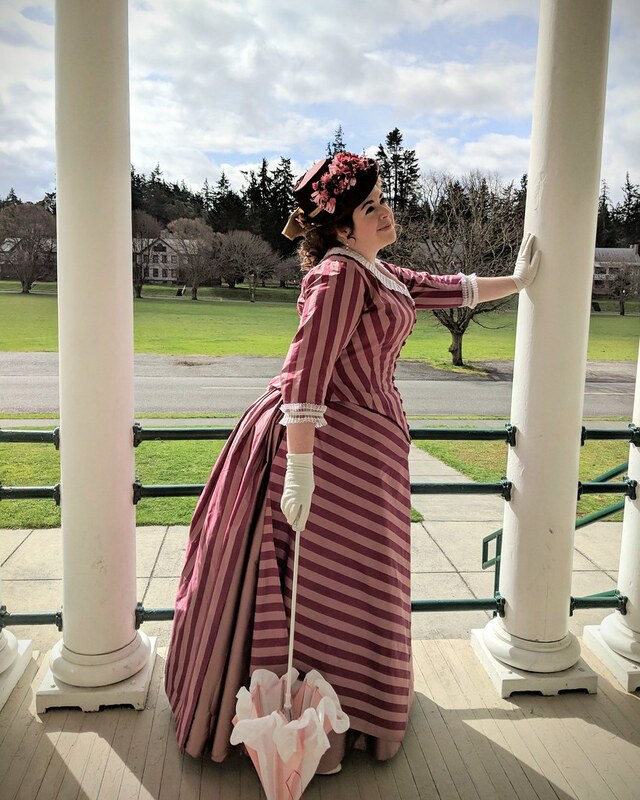 I decided to go with hooks and eyes up the back and to wear my Regency corset, but with the wooden busk replaced by two side-by-side steels. 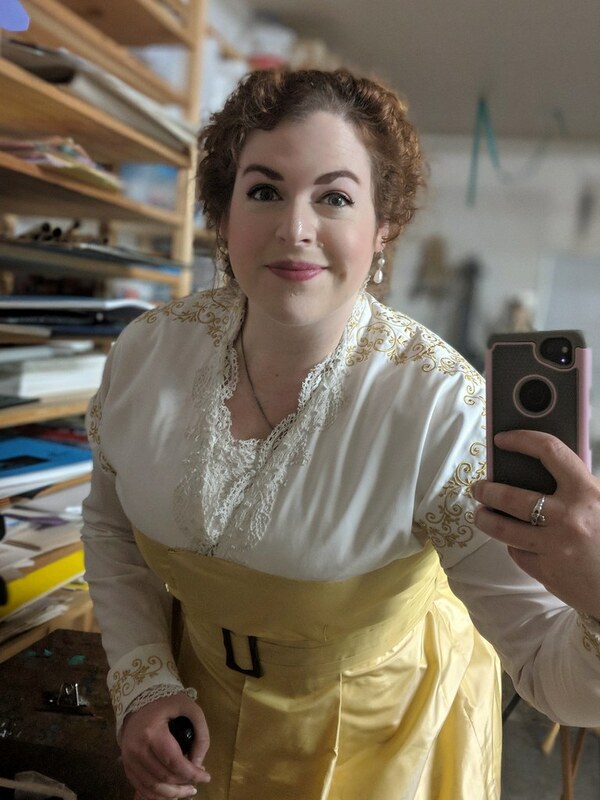 I'll wear the corset whenever I'm wearing this dress, and I think I'll put it back on before "Who Will Buy" as well, since that's one less thing I'll have to change between the end of the song and the next Widow Corney scene, and the choreo for that song is pretty simple. 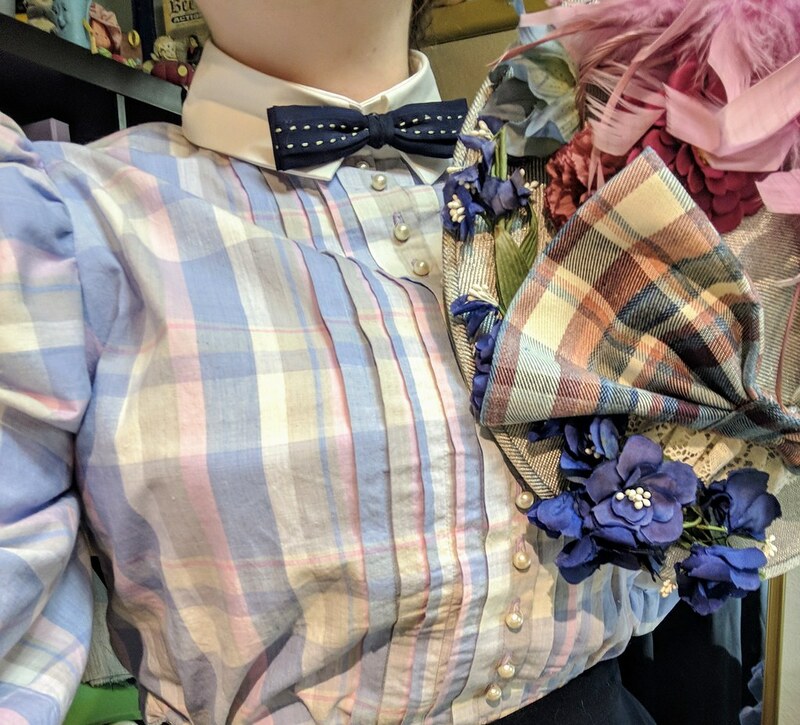 I tried doing the choreo for "Consider Yourself" with the corset on, but it's way too complex, and requires a lot more flexibility than the corset allows, even without the wooden busk. And then for "Oom Pah Pah," I'm supposed to be drunk, and it's harder to be floppy drunk in a corset. I'd like to make a big floofy 1830s cap for this, too. Does anyone have any pattern diagrams that they recommend? I re-pleated the second sleeve yesterday, and am halfway done adding the velvet bands. Today, I need to pleat the lining for the second sleeve, finish stitching down the velvet, and set the sleeves. 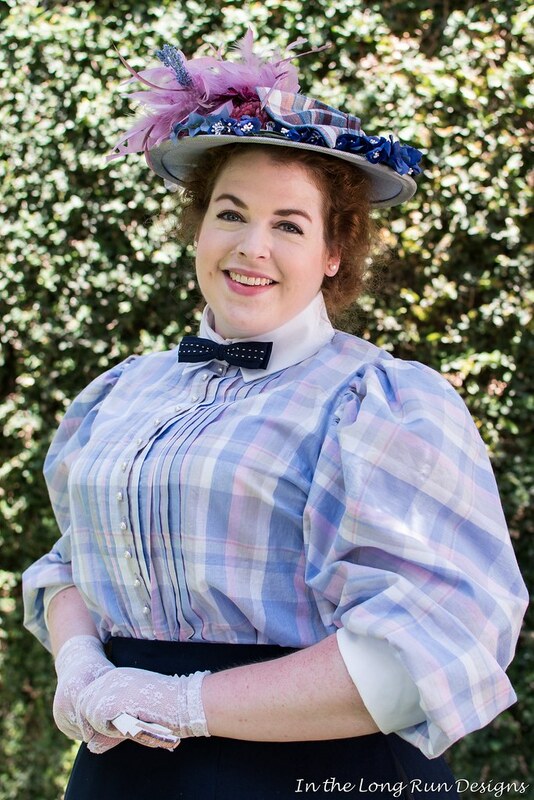 I'm facing a conundrum, though - I'm wearing this first in Oliver as Widow Corney. Although I'm not dancing in this dress, I am dancing in the ensemble numbers in the show. 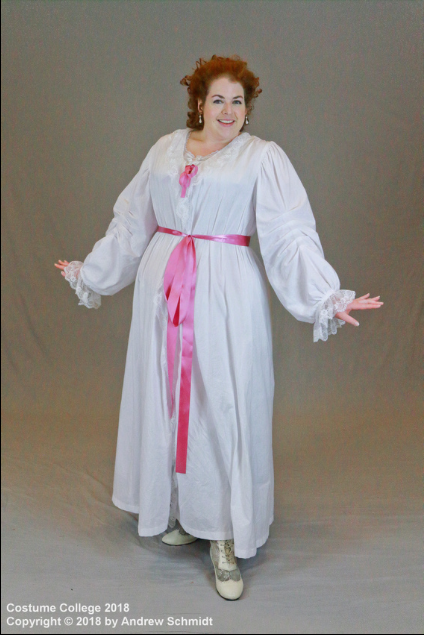 Now, I built this dress to fit over my long-line Regency stays, but with the wooden busk in those, I can't do the choreography. 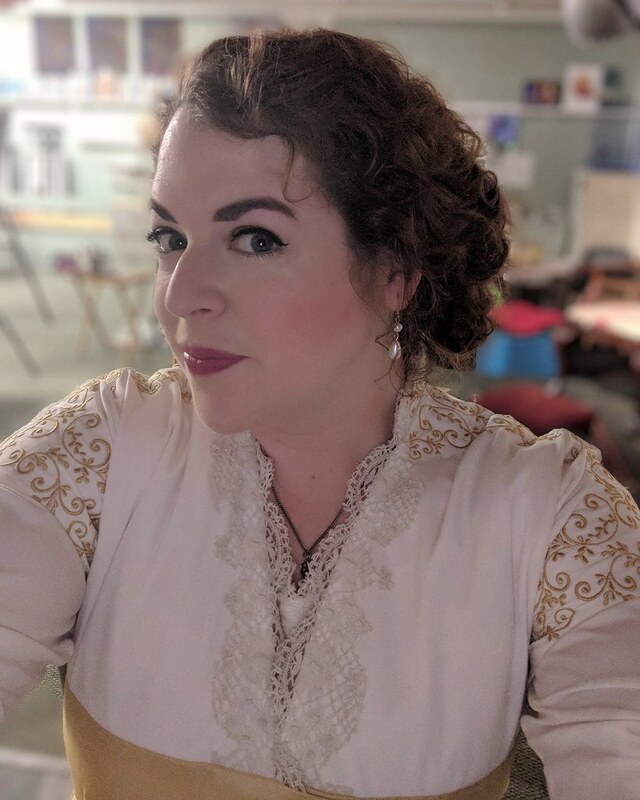 So I figured it probably wouldn't be too big of a deal if I wear an underbust Victorian-style corset for the show, and just move over the hooks and eyes on this dress closure if necessary. 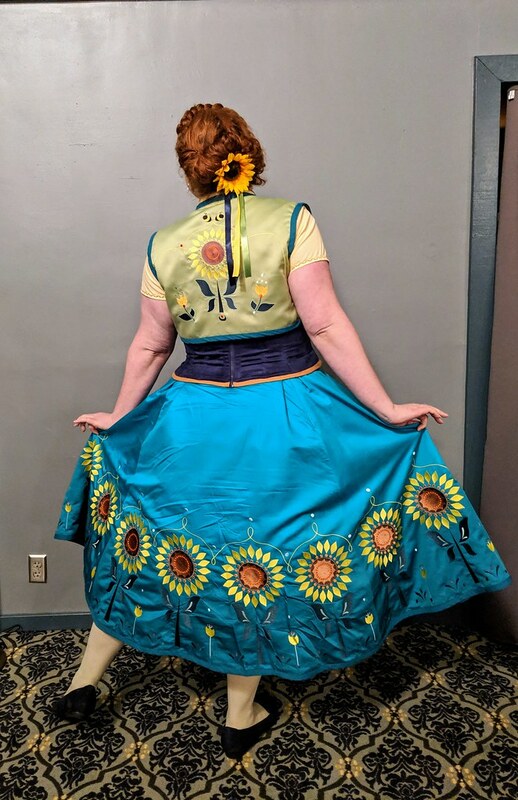 But the underbust corset actually causes my mid-back (just above the corset line) to be too large to fit in the dress with the overlap required for the hooks and eyes. I worked on some costuming stuff for my show over the weekend. My bf and I distressed six lab coats, attacking them with scissors, an exacto, a belt sander, coffee, eyeshadow, and mascara until they looked appropriately grimy. 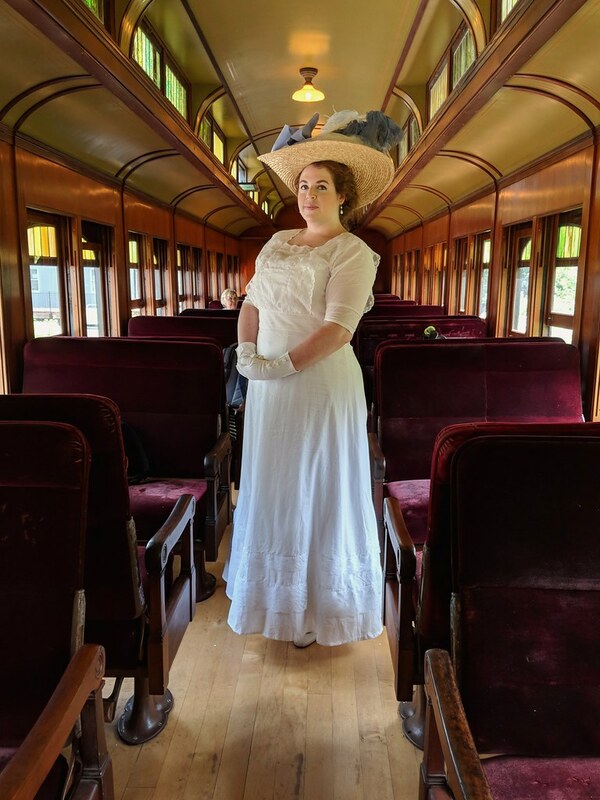 I also made 14 cotton shoe bows, turned a pair of old leggings into bike shorts, and made red sequin bows to pair with my crazy 1830s hairpiece, since I'll be using it for the show. 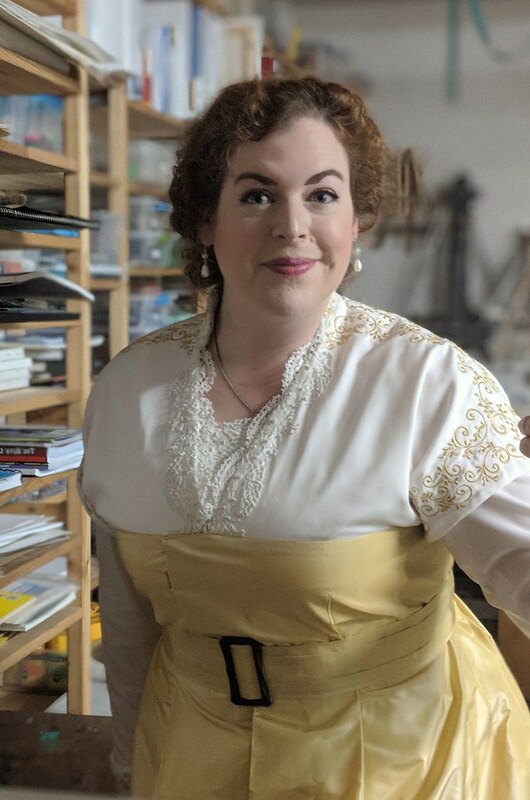 I'm still trying to figure out what to do with my hair in act 1. 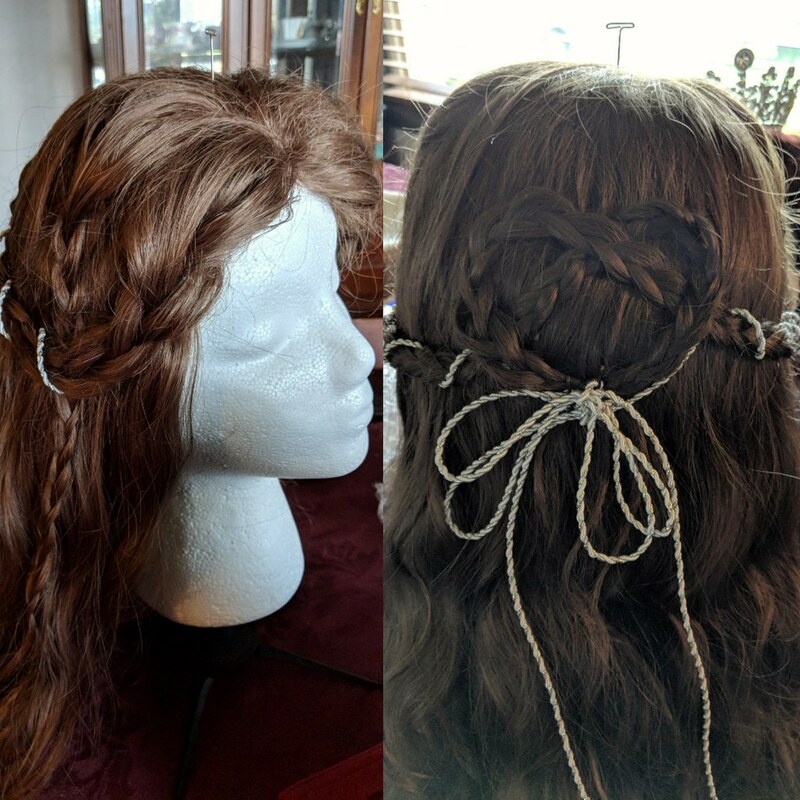 I bought some new braids to try out that match my current haircolor, but I can't decide whether I want two hanging loops, two braided buns with the rest of my hair down, or a crown braid, or a high braided bun, or some combination of those. It's supposed to be a casual hairstyle worn with pajamas, but also possibly a tiara. The baroness is a bit crazy, after all. I got one more gusset and seam done today, but that's it. But rehearsal was sooo much fun! We choreographed the Bombie Samba (I'm playing the Baroness), and I don't think I've danced that much in a long time. It is so fast and so much choreography, but our director/choreographer is amazing, and all the other dancers are incredible, and it is going to look so good! Hopefully I'll have some energy to work on my corset after my caroling gig tomorrow, though it's probably unlikely. I did do a little work on the sheer dress before I took my sewing break this weekend. I got the bodice assembled, and started to fit it. I had one of the front sides fitted before I got overwhelmed (the sheer outer layer needed quite a bit of altering). I have since fixed the other front side to match. Most of it involved redoing the shoulder seams twice, and taking out quite a bit of excess fabric from the shoulder. I also enlarged the armseye slightly, since it still seemed way more dropped than it should be for the 50s. Then today, I tackled the back. I was going for a back that was gathered into the waistband, but it just looked ugly and poufy, so I made a CB seam in the sheer layer to match the layer underneath, and it is now a fitted back. I also hemmed the skirt. 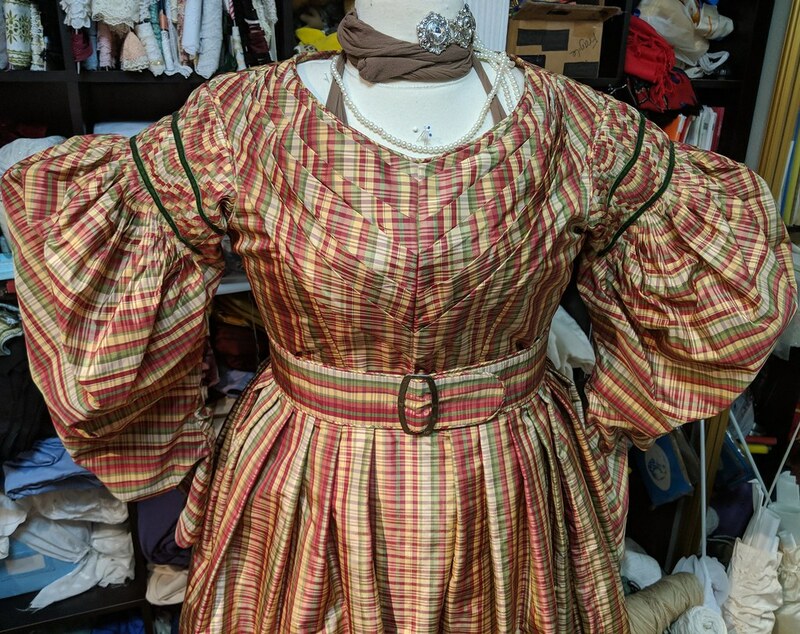 I'd really love to get sleeves done tomorrow, and maybe even do all the bodice finishing, because then it will be done! I need to finish both this and Ariel by the end of next week. Here's a pic from when I put it on to figure out the hem today. I'm wearing my old hoops with no hoop connecters on the bottom two hoops. I'm trying to keep the bottommost one around 100" circumference, but I don't want to cut my hoop steel, especially since you can't buy it anymore. It seems to keep itself in place pretty well, even without anything holding the steel in place besides the channel, but does anyone have any suggestions for actually securing it?